This is a story for everyone who has a need of tools no matter what their craft or trade. The Carpenters Hammer, a painters brushes, the janitors broom. A few years ago, about eighteen in fact, we lived in a 2 bedroom flat in Christchurch city. It was in a block of four on a section which probably should have only held one house, but that’s a whole other issue. In the back flat lived a retired gentleman, who’s name quite escapes me now. He had worked most of his adult live as a cleaner for PDL, an electrical manufacturer here in New Zealand. One day I remember walking down the driveway to the garages which were squished in a row behind the flats, he was out sweeping the driveway in front of his unit with what is probably the largest broom I’d ever seen. One of those large janitorial scale ones that requires metal braces from the handle to the head to stop it breaking off on it’s own and sweeping whole counties. I said good morning, or afternoon, whichever pleasantry was appropriate, and found myself in conversation about his broom. Not the most engrossing topic, but being a polite fella I shared the moment and learnt that he was in fact very proud of this broom which had been gifted to him by PDL Industries on his retirement. This particular broom had accompanied him through the last 20 years of his working life, although I suspect it probably was a bit like the proverbial granddad’s axe and was on it’s second head and third handle. I failed totally to grasp the significance of the broom, although I was impressed that he’d been using the broom for around the same time I’d been on the planet at that stage. I’m somewhat hesitant in hind sight to say that I have on many occasions over the years told the story about our neighbour who was so proud of his broom as a joke, not with the respect I’ve come to realise it deserves. Recent events in my shed have given me a whole new understanding of the broom and the place it held in his life which I found amusing at best. 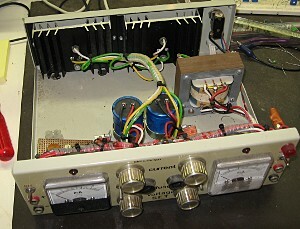 I speak now in hushed tones of my trusty bench power supply. I built the supply with Dad when I was in the fifth form. For twenty three years or so I’ve been using the power supply for all sorts of random electronics experiments. When I was running my electronics business it was a constant companion through many late nights of debugging microcontroller code until the sun came up. It powered the prototypes for all manner of devices which found their way to customers in all corners of the planet. It even did service as a supply for a strouger telephone exchange relay gaffer taped to the school’s back stage wall during a production in 1989 to drive special effects which I think was it’s proudest moment. I wandered out to the shed this evening, as I do on many occasions, to try out an idea that’s been brewing in my somewhat confusing grey matter. Thirty minutes I figured, to test out the idea and scribble some notes. No worries. The trusty bench power supply was sitting there smugly powering a small FM transmitter with the left half of it’s dual personality. The right supply turned off. I flicked the switch, the wee red LED blinked on and the voltage needle popped up to indicate 12 volts. Back it down to five, set the current limit….. That’s odd, the voltage hasn’t changed. Oh. Without my assistance the needle was doing a demented death dance between 12 and 18 volts, then it fell, slowly, purposefully to nothing. Somewhat symbolically the supply is not actually adjustable to read zero volts, so this was a disturbing omen. To say I panicked at that point would be an overstatement, but I do believe I broke out in a cold sweat. What cruel trick is this? It can’t be dead, not my power supply, after all that time on the desk at home, the flat, three houses, gallons and gallons of coffee. Calm down, pop the fuse, it’s blown. Dig through my fuses box for another one, fit it. Nothing. At that point I will swear I heard a duck fart on Lake Ellesmere four miles away. Sure, I’ve looked at those modern flashy bench supplies with their digital readouts and dual rails, but why did it have to be like this? Why now? I’m not prepared to replace the supply, it’s only just run-in. So, off with the top to inspect the fine handy work I created so long ago. I can’t remember how much Dad did, and how much was my school-boy handy work, but it’s still a pretty solid bit of DIY electronics by any standard. Nearly a quarter of a century of service a testament to that I suppose. 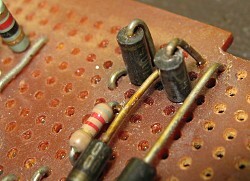 The two diodes which failed. The moral of this story is more important than the technical detail, but I found the fault after a bit of fiddling and replaced two diodes in the bridge rectifier which had mysteriously been replaced with a dead short. Drama averted, and the status quo re-established. I’m looking forward to another twenty three years of service. So to all the people of the years who I’ve told the story to about my neighbour who adored his broom; I humbly withdraw the humorous version of that story, and tender one of measured respect for both the broom and our good neighbour who recognised it’s value far more than I.